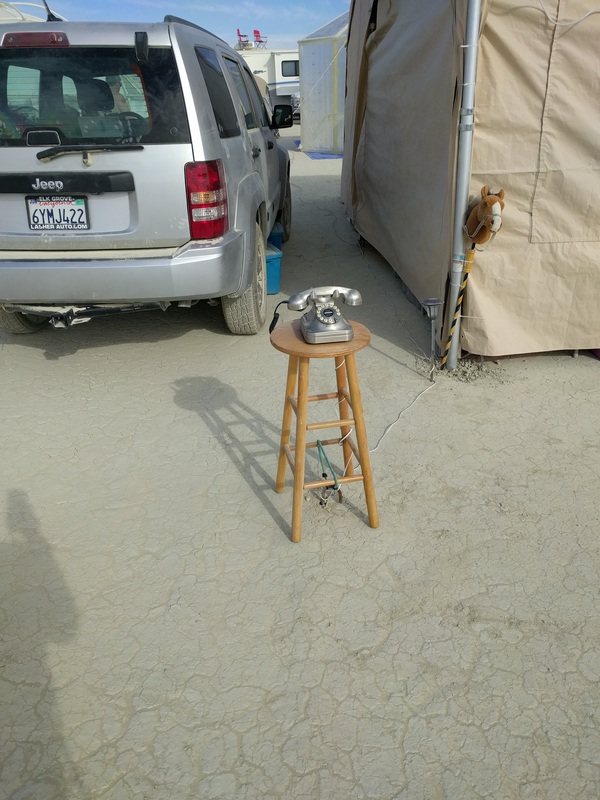 As you may be aware, we brought a faux-rotary analog telephone to the 2016 burn and placed it on a stool by the road outside our camp. Approximately 2 weeks prior to the burn one of our telephonically-inclined camp members decided to try this project on a whim, not really expecting anything to come of it. There have been other phones on playa for years, we just wanted to have our own. It was setup just like any standard phone line on this camp member’s phone system, with call waiting, voicemail, etc. He set it up Monday morning. Later in the morning another camp member posted the number on /r/burningman and two Burning Man related Facebook groups. And the phone began to ring. And ring. And ring. We answered some calls but mostly called passersby over to answer calls. The first few days, the calls came in so fast that we would pick up one and immediately hear the call waiting tone of another call coming in. We left camp for the evening on Monday night, and came back to find a group of people gathered around it, answering calls and excitedly talking to random people from all over the world. We went to bed and woke up the next morning to find it still ringing. We made improvements throughout the week, such disabling call waiting and adding some chairs to the front of our camp for people to sit in and take calls. We wrote the phone number on a whiteboard, and a few other bits encouraging other participants to take calls, or if it wasn’t ringing to call their mothers. We’ll be going through the voicemails, removing the empty ones, censoring any personal information that may have been left, and posting the rest. We are already working on improvements for next year. If you want to get in touch with us, find us on Twitter or Facebook, or email hashtag@octothorpe.club.